It’s been a very interesting first few weeks with which have landed us with the new expansion team Vancouver Titans sitting on top of the league right next to New York Excelsior. It seems obvious it’s going to be one of these two teams that take out the first set of playoffs on Sunday and Monday this week, but let’s look at how we got here. While an interesting first stage, it seems almost fitting that it has been plagued in a weird way by the biggest problem with last year’s first stage – stagnant comps. Last year we saw the absolutely dominant dive composition with Winston and Mercy as a must pick for every round. It didn’t take long for players and viewers alike to get a little bit bored from seeing this over and over again and this fatigue has also set in for this stage of the league. GOATS has reigned supreme and, if you’re not familiar, this is a composition consisting of three supports and three tanks. It’s undeniably incredibly strong right now and works by having the teams stick together to move as one unrelenting force. The problem with GOATS is being anti-goats tends to get you killed, even if you’re trying to combat it. The best way to fight fire is with fire and when everything is burning forever it’s not that fun to watch. This is where I’d love to give a shout-out to the Chengdu Hunters, who have been one of the best teams to watch so far. This unorthodox team likes to bring out weird compositions which are more commonly used in China and boy is it nice to see some variety. Their Wrecking Ball play has been incredible, but also turned into their weakness once other teams worked it out. This is unfortunate as it robbed them of a spot in the finals, despite being able to almost go toe-to-toe against the Titans when they did decide to abide by the conventional, yet boring, meta. Another bright spark in this meta has been Sombra use. I find Sombra both frustrating and fun to watch and a lot of that depends on if they’re on the team I want to win or not. Her ultimate stops secondary abilities from working and if done right can almost disable an entire team. Good Sombra play is almost always a guaranteed win for that team fight so it can feel like pressing the win button rather than a fair battle. Because of her strength, she’s put a bit of variety to the GOATS meta, though, which is sorely needed. Perhaps more importantly, she was instrumental in getting the previously winless Shanghai Dragons’ first victory, which was clearly the best moment of this season. Weirder than Shanghai finally managing to win a round is that fan favourites and season one finalists LA Valiant are sitting at the bottom of the ladder. This team was very strong last year, largely in part thanks to our very own Custa (Scott Kennedy). His Mercy play and shot calling seemed to serve the team well but we have barely seen him play at all this year. This could be because Mercy is not currently relevant in the meta but I highly doubt he’s that much of a one trick pony. There were some comments made by Valiant coaches which implied they weren’t using Custa because he was just too smart for the rest of the team. They implied his knowledge of the meta was too good and his team just couldn’t keep up. 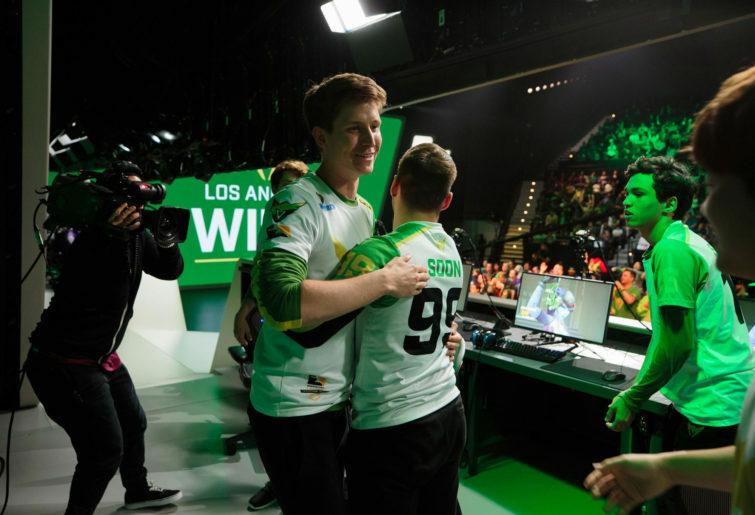 This all sounds a little bit fishy but hopefully, we’ll see more Custa in the next stage and the green and gold LA can climb their way out of this incredibly deep hole. Another team that’s been heavily underperforming based on past exploits are the London Spitfire. These guys won the finals last season and now can’t seem to find their feet. They’re not as low as Valiant but they are definitely a lot closer to the bottom of the ladder than the top. They’ve been doing so badly that I don’t even expect them to win when I see their name on the fixture anymore – they’re lower on the ladder than Shanghai. The good news is there are some pretty big changes coming into the next stage including a new character and tonnes of tweaks which we can go through next week. It’s bound to shake up this stagnant meta and bring back the interesting and unpredictable Overwatch League.